The Foul Flag Championship was a baseball association that operated in Little Rock, AR in 1875. The association consisted of five amateur Little Rock teams. The Foul Flag Association was created in August, 1875 to determine which of Little Rock’s many amateur teams was the best. Fred Syberg was made president while George Russell Brown and Andrew Eakin filled the other spots on board. All teams who entered into the association were required to play under the rules of the National Association of Professional Base Ball Players. In addition, all teams were required to play three games with every other team. However, because the season did not start until September, no single team was able to meet this requirement. Subsequently, the rule was either lifted or intentionally overlooked. Sixteen total games were played between five teams. The tournament was won by the members of the Accidentals, who were awarded with the championship flags. The runner-up ‘Independents’ were voted the best team and presented with a special bat made of 78 different pieces of wood valued over $100 dollars, equal to about $2000 today. 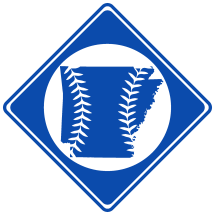 The Arkansas Gazette reported that the Accidentals won 6 games, the Independents won 4, the Phenix won 2, the Arsenals won 2 and the La Roques/Red Sox won 1. However, tallying up the known games reveals that the Accidentals won 7 and the Independents won only 3.